In 1973 I was married to a woman I had been dating for several years. It was a bad match in so many ways, but throughout the marriage I maintained a job and a steady output of drawings, paintings and artistic projects. In 1976 I turned a chicken coop/shed in the back of our recently purchased house into a studio for my art and then also my business (we'll talk of that later). The building contained a lower level of shed garages and a loft with approximately 400 square feet of space. With the help of a friend, I repaired and reshingled the roofs, painted the outside, fixed the windows and doors and installed an inexpensive and inefficient modern fireplace, gas heat, electricity, a phone and a track lighting under which I painted large canvases. 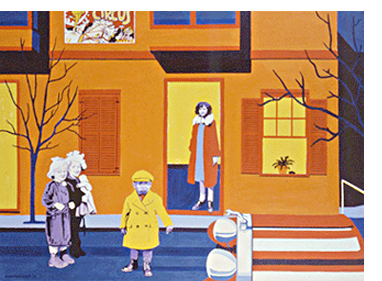 At first, the canvases mimicked my pen and ink drawings, but by 1979 I had expanded to color...lots of it. And the canvases were very large, since my studio would accommodate large paintings. One of my first transitional paintings was The Musicians. 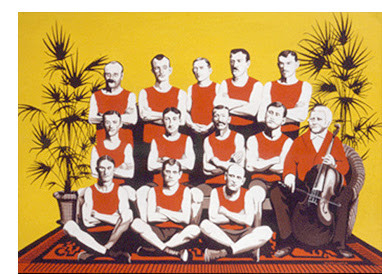 On my website I site my inspiration as photo of a group of fireman, but I now believe it was a rugby team. Each of the characters has his distinct physical look which I simplified into a sepia toned graphic form. I placed the team on an oriental rug and flanked them by potted palms. The man seated with the cello added a touch was intended as an absurdity. I wanted the viewer to wonder why this group of men in shorts and T-shirts were posed with a musician. In truth, the cellist could have been anything, but in his red jacket, he seemed right for the scene. In the late '70s my life was also somewhat in turmoil. My mother had been ill for some years with uterine cancer and rheumatoid arthritis. She had lost a great deal of weight, and my father and she still lived in the 3 room apartment that I had live in until my marriage at age 25. I photographed my parents in their small living room less than a year before my mother died. Using a palette of bold colors I created a near life-size portrait. In many ways, the painting was unsympathetic to my mother who looked much older than her years. Her frail body, knotted, arthritic hand and stern face belied the attractive woman of some years before. Her life had been hard on her mentally and physically. My father appears somewhat sad and broken, but genial. Despite his failures and his drunken rages, he had always been the kinder of the two. In looking back, I know I was unkind in my representation of my mother, especially after showing it to her, a lady who had been proud of her looks as a girl, but had lost her beauty and dignity with sickness and age. I also believe that the portrait accurately depicts them at this time. In this same period, I created Golden Boy, a painting featuring a little black boy and his mother at their simple city home. Two white girls are also in the scene, smiling at the camera. A circus poster is pasted on the second floor wall, and a car from the 1920s is entering the scene. I had no real idea what the painting was about when constructing it. It is more about the color and the placement of elements included in the picture. The children may have been used as a nod my daughter, Noelle, born to my wife and me in September of 1979. Children appeared in many of my pieces both prior to my daughter's birth throughout her infancy. I also was truly breaking away from size and color restrictions and a monochromatic pen & ink pallet. 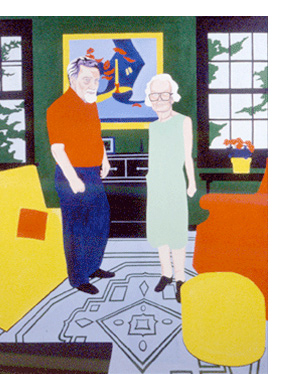 Bold, flat colors dominated work in this period and were to see me through the 1980s, though I Still Life used our living room minus the furnishings. A flat yellow wall and a red rug is revealed through a doorway. 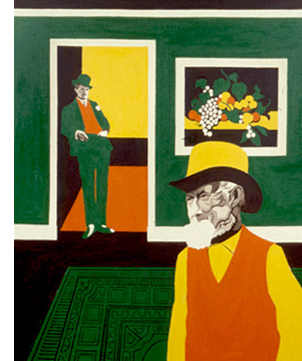 An old man dominates the foreground, and a still life painting decorates the a pure green. Once again, this is an exercise in color and design and an attempt to simplify my style while maintaining the characters and a theme begun in my pen & ink work while I continued to work in pen & ink. Noelle was a little over two years old when I separated from my wife in October, 1981 and left my house and studio behind. I moved my design business to a small office in downtown Media and took a room in Swarthmore, then moved to a loft apartment in Newtown Square. I maintained contact with my daughter taking her to dinner on Wednesday night with my father and having her stay with me every other weekend. I also maintained contact with my inlaws during this period. Parallel to the separation with my wife, my mother's condition worsened and I found and paid for a home for her in Norristown. My mother died less than three weeks later. She was buried in my father's family's mausoleum, and I held the funeral luncheon in my loft apartment. The apartment was in an 18th or early 19th century shop with one wall was flanked with field stone. Skylights provided light augmenting and light the tiny upstairs windows could provide. I set up my easel in front area of the large living room and would work at nights. During the day I tried to concentrate on building my design business, watching over my father, and keeping in touch with may daughter. At night painted while listening to the squirrels running across the attic floor. I painted under a portable incandescent light and took a slightly new direction combining elements of things remembered from my past. Kurt Weil and his Three Penny Opera was one of my subjects, and my grandmother as a young woman was featured in another painting Grandmomma Was a Pretty Lady! with family names and reminiscences. It's Too Much Coffee - acrylic on canvas, 1981. 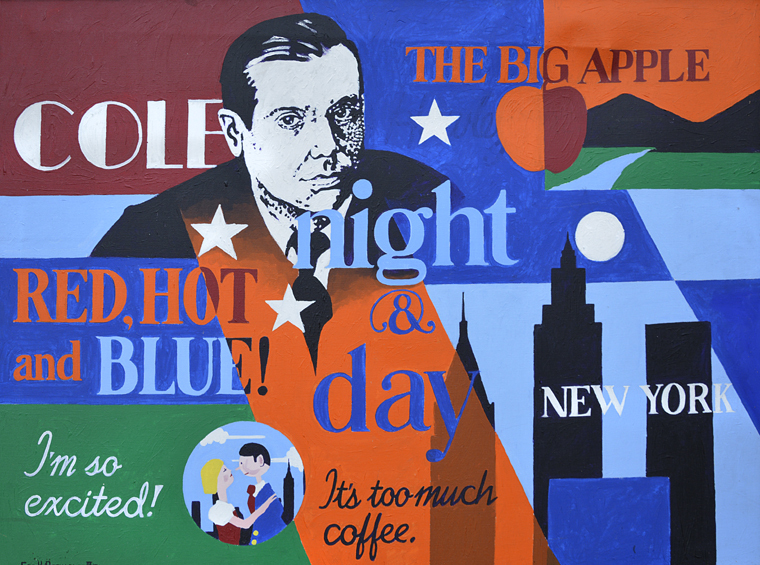 A favorite of this period was of Cole Porter, evoked from a recent trip to New York City. Title "It's Too Much Coffee." Completed in 1981, this large painting combines type, graphics, illustration and color in an "advertising" way without promoting anything in particular. I had often used copy in my paintings before to tell a story, and this story, though abstract to the viewer, enabled me to express a personal feeling and a connection to events both past and present. I only created a few paintings during the 1980s, but continued to create pen and ink drawings for Christmas cards and illustrations for customers as part of their promotions. My primary job was to keep my business in operation and to make money using every ability and talent I could muster to build a client base. This didn't seem impossible to me; I promoted upstart bands with no money; gave away work to the community to show good will; and joined the Art & Architectural Design Review Board in Media and the Media Business Authority to play an active role in local business. and government.